The Maruti Suzuki WagonR is one car that has been loved by the Indian audience. Scoring high on practicality in a package which is small and compact enough for our winding city streets, the WagonR has now entered its third generation of production. 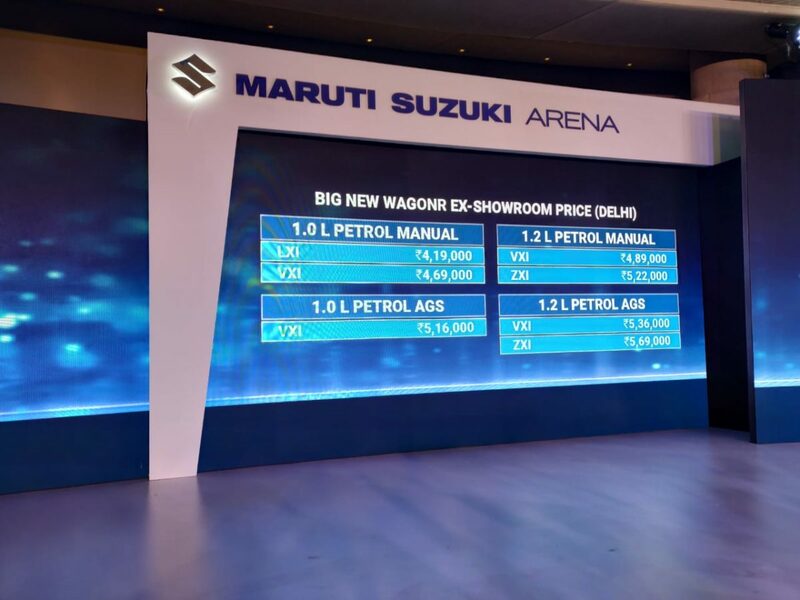 Launched by Maruti Suzuki today, the WagonR will be offered in a variety of trims and gets 2 engine options as well. The 1-litre engine is offered in two variants – LXi and VXi which are priced at INR 4.19 Lakh and INR 4.69 Lakh respectively. The larger 1.2-litre engine is offered in the variants – VXi and ZXi. These two variants are priced at INR 4.89 Lakh, INR 5.22 Lakh respectively. Moreover, there also is an optional AMT gearbox available in the VXi and ZXi trims, which will cost you an additional INR 47,000 over the base price of the VXi and ZXi variants. The new generation WagonR carries huge changes in dimensions and much more. The flat surfaces of the previous generation car have been replaced by more curved panels. The side profile is highlighted by a strong shoulder line which travels above the pull type door handles. The new generation car also gets a floating type roof design. The rear gets a new taillight assembly, extending till the roof of the vehicle and looks very premium. 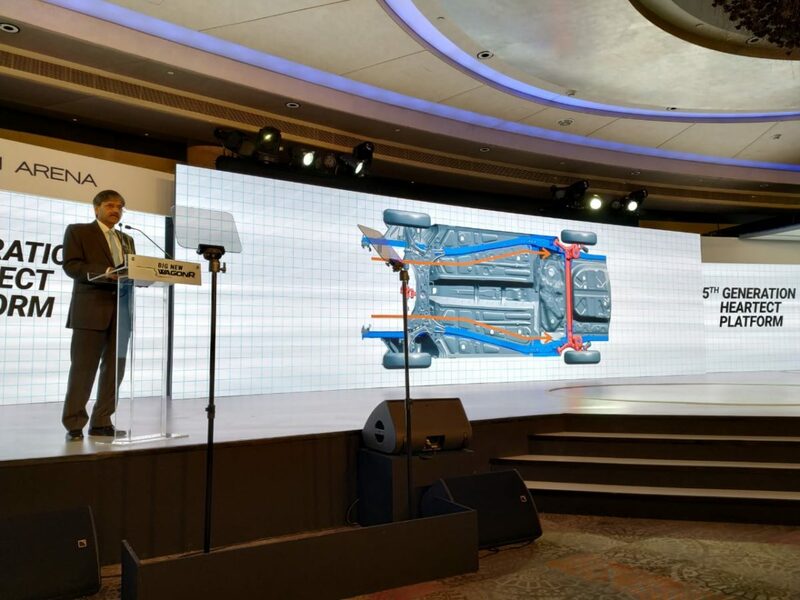 Underneath that body is the 5th generation HEARTECT platform, 40% of which has been made from high tensile strength steel. The use of that metal enables better strength, safety, rigidity and NVH performance. The 1-litre motor generates 67 hp of peak power and 90 Nm of peak torque while delivering fuel efficiency of 22.5 kmpl. The 1.2-litre motor, on the other hand, generates 82 hp of maximum power and 113 Nm of maximum torque with a claimed fuel efficiency of 21.5 kmpl. A 5-speed manual gearbox is available as standard for both the engines while an AMT gearbox, what Maruti Suzuki calls AGS can be equipped as an option. The inside of this new tall boy has been overhauled as well. The interiors look more up to date and appear to be of better quality and have been finished rather nicely. The centre console gets the next generationSmartPlay Studio Infotainment system. It essentially is a 17.78 cm (7-inch) touch infotainment system that combines a smartphone, vehicle and cloud-based services to offer a delightful driving experience. Users can not only stream their songs directly, but they can also surf the web, get weather updates and find local eateries. As we have seen with the new generation of Maruti cars, safety has been taken seriously with the WagonR as well. The strong structure itself helps the car to be much safer but other safety aids like Driver airbag, ABS (antilock braking system) with EBD (electronic brake force distribution), front seatbelt reminder, speed alert system and rear parking sensors make the car much safer. All these aids listed above will be made available as standard across all trims in the all-new WagonR. The car will be offered in a total of six colour options. While the basic shades of Silky Silver and Superior White have been seen before, Maruti has added 4 new shades in the colour palette of the all-new WagonR. These 4 shades are – Pearl Poolside Blue, Pearl Nutmeg Brown, Magma Grey and Pearl Autumn Orange. The new WagonR will be up against the Hyundai Santro, a very old competitor of the smart tall boy hatchback. Below are some images of the car from the launch event.